Yesterday we were talking with an entrepreneur who was selected for Springboard this year. She has been working over the past six weeks with a team of coaches, as a group and individually, to refine her investor pitch, make connections, and hone strategy. As it often happens during these check-in calls, she was experiencing what Fred Wilson calls Mentor/Investor Whiplash, where you’re forced to reconcile conflicting advice from smart, respected experts. It can be difficult to be coached on your investor pitch. No one in the startup world is shy about their opinion, so you’re constantly being advised to add a slide on competition or financials, remove the second slide on data and the slide with your advisors (just move that to the appendix), and spend less time on the product. Then fast forward to your next conversation with an advisor and they’re telling you the exact opposite. Ultimately you need to be a filter, not a sponge. As Brad Feld put it, your job is to sort the signal from the noise. Getting advised to remove full slides from your pitch is very common. After all, most investors want to see a 10–12 slide deck. Guy Kawasaki’s 10–20–30 rule for powerpoint still reigns as the gold standard. When we start the coaching process at Springboard, we have each entrepreneur run through their 10-minute pitch deck on a group conference call with their team. The average starting point is around 18 slides and 15 minutes. Usually some of the first pieces of advice from the team are the slides that were missing from the pitch, which means there are many slides that need to go. When I’m working on a pitch deck for Springboard, I’ve found it’s a lot easier to remove a slide from the main presentation if I have an appendix. 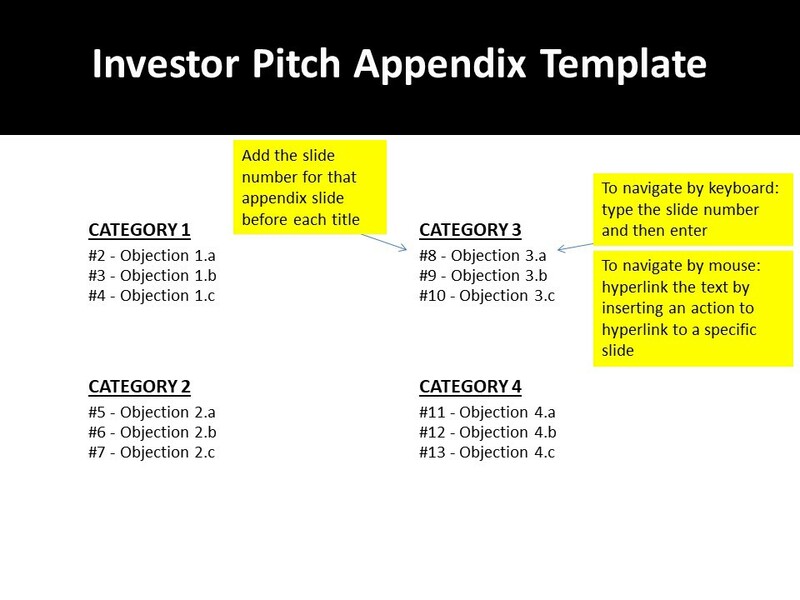 With time, as you pitch and get feedback and revise your presentation after each meeting (based on the questions you were asked), your appendix will grow. It can become disorganized and you can quickly find yourself advancing back and forth through the slides as your answer questions. I’m the VP @ Springboard, a venture catalyst and premier global network of women innovators transforming industries. Follow me at @joshuahenderson or joshuahenderson.com and find Springboard at sb.co. If you enjoyed this article, please click below to recommend it.